For peace, for strength, for courage and inspiration, look "Unto the Hills"
Day by day, you can join the nation s most beloved spiritual leader for a moment of quiet and reflection a Scripture, a thought, and a prayer. 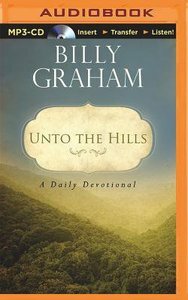 Billy Graham draws from his lifetime of study and ministry to offer this devotional classic, featuring 365 meditations to calm you and point you toward the One who can always help. About "Unto the Hills (Unabridged, Mp3)"